Steve Aichele provides legal counsel on complex real estate development projects where issues involving land acquisition, approvals, financing and construction intersect with federal, state and local governments, particularly in Pennsylvania. 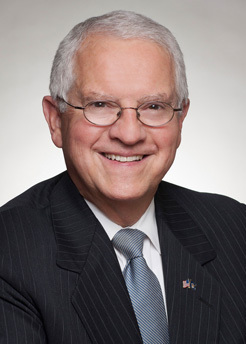 While Steve has spent much of his 40-year career in private practice advising major developers, lenders and government entities on projects from their inception, through government approvals, to building and management, his perspective is also shaped by his experience serving in Pennsylvania state and local government. From 1983 through 1995, he served on the Planning Commission and then the Board of Supervisors of Tredyffrin Township, a 30,000-person municipality in suburban Philadelphia, and from January 2011 through October 2013, Steve was General Counsel and Chief of Staff to Pennsylvania Gov. Tom Corbett's administration, roles that required him, respectively, to run an office serving the legal needs of the entire executive branch and to manage its daily operations. Underpinning the advice that Steve provides clients is a desire to help them balance their sometimes competing needs to meet government regulatory requirements and to move at the speed and with the precision required to pull off major real estate projects. Because Steve has built a career on negotiating with, and for, government, he understands the dynamics involved in these interactions and has deep experience navigating them. His sensitivity to the business needs of his clients is also shaped by the many leadership roles he has held at Saul Ewing Arnstein & Lehr, including past service as Managing Partner and Firm Chairman. Befitting his understanding of the complexities of government, he currently co-leads the firm's Regulatory, Compliance and Government team. Before joining Saul Ewing Arnstein & Lehr, Steve served more than four years active duty in the U.S. Navy and retired from the U.S. Naval Reserve after 25 years of total service with the rank of Captain. The Pennsylvania Convention Center Authority in a $800 million dollar expansion encompassing an entire city block. A developer in assuming private ownership of land in order to facilitate the redevelopment of three city blocks in downtown Philadelphia. The work included providing the legal foundation to aggregate publicly- and privately-owned land that had been controlled by an authority to transfer these parcels to private ownership and to adjust the underlying funding arrangements involving city and state government. Overlapping issues involved eminent domain, streets, public transportation historic protections and air rights, all regulated by government entities. A major regional health care provider in the $150 million expansion of one hospital and the "greenfield" development of an entirely new hospital and ambulatory care facility. The owner of an 1,800-acre tract in rezoning, land use approvals, and disposition of land. This eight-year process involved creative use of "Unified Development District" zoning to create 700 acres of public open space, as well as mixed use areas consistent with the latest land use practices. The owner of a 125-acre "brownfields" project in rezoning, land use approvals, financing, and development of an abandoned steel plant property. The Unified Development District includes residential, office, commercial and retail, and hotel uses on a redevelopment site in the middle of a borough vacated by the failed steel plant. One of the nation's largest defense contractors in negotiations with the Commonwealth, County, and local governments and agencies to expand facilities, establish rights with respect to road and Turnpike access, and obtain rezoning to enable disposition of certain parcels.